The UR3 robot is the smallest and most affordable collaborative robot, With its 3 kg payload and its small footprint makes it suitable for table-top use and allows it to work where the UR5 or UR10 do not fit, The UR3 is the only model to offer infinite turn on the end joint, It is the most flexible, space-saving, and lightweight table-top robot in the collaborative series. Universal Robots UR3 is the newest robot from Universal Robots, It is a smaller collaborative table-top robot for light assembly tasks and automated workbench scenarios, The compact table-top robot weighs only 11 kg (24.3 lbs), but the arm has 6-axes and has a payload of 3 kg (6.6 lbs), 360-degree rotation on all wrist joints and infinite rotation on the end joint. UR3 collaborative robot is the most flexible collaborative table-top robot to work side-by-side with employees in the market today, It is a small compact robot, It is used for medium to long term installations where repeatability is needed, The compact size of the UR3 makes it really good for mounting on or in a machine. It is an optimal assistant in assembly, polish, glue, and screw applications requiring uniform product quality, It can be used in a separate work station mounted on the table, picking, assembling and placing parts in optimized production flows, due to its compact form and easy programming & it makes the total cost of ownership low and payback period ultra fast. The UR3 robot is used in many industries such as medical devices, circuit boards & electronic components, It is built with the same proven collaborative technology as the UR5 and UR10 robot arms, All three collaborative robots feature the same safety system and 0.1 mm repeatability, UR3 robot has automated tasks up to 3 kg (6.6 lbs) (like his name is proposing), It has reach radius of up to 500 mm (19.7 in) and it presents the fastest payback in the industry. The UR3 robot is the perfect choice for companies looking to automate applications that require 6-axis capabilities where size, safety and costs are critical, It has a 6-axis articulated arm that can perform a host of tasks including pick-and-place, soldering, screwing, gluing and painting in close collaboration with human workers. 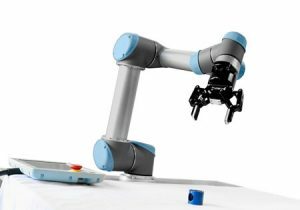 UR3 robot has a compact size and easy set-up and programming, So it is easy to switch between tasks to meet a variety of manufacturing needs, it is the finest assistant for jobs in assembly applications requiring uniform product quality. The UR3 robot is used for picking and placing parts in optimized production flows, UR3 robot is easy to use, It is easy to mount in a machine, It is faster, It has a more rigid design, It has proven UI and workflow, It has a big ecosystem of tools, integrators, programs and use-cases, It comes with a lower price. Cobots are designed for collaborative applications, They have different specifications, They can increase productivity, reduce injury and boost morale, Cobot arms are used by all sizes in organizations, They are easy to use, They are safe, They can work alongside the people effectively with no safety precautions needed, They are simple to teach, and people with no programming knowledge can quickly set them to perform tasks thanks to the clear 3D visualization interface. The collaborative robot will copy the movement and get to work, They are designed using smart technologies that integrate the sensors that can detect people in their way and avoid collisions, they are intelligent and not just a bunch of devices attached to repeat actions without monitoring the possible changes and interferences in their immediate vicinity. UR3 robot has a small work envelope, UI and controller is dated, Teach pendant is heavy, Installations need to have guarding unless specific requirements are met, It is the smallest robot, it offers a lower payload, The arm is a 3 kg payload (like his name is proposing), and the reach is way smaller, With a smaller reach you want to use this robot for smaller application such as soldering, glue appliance and many others. The robot has less vision and sensors because the company want to keep things simple, Since a lot of applications do not need vision sensors, buying a robot with such sensor would be useless, This way they can lower the price of the robot and offer the same model for everyone without any extra.